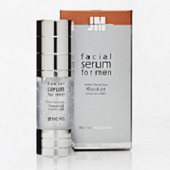 Designed specifically for men, this lightweight, mineral-rich serum helps reduce the appearance of fine lines and wrinkles and improve texture and skin tone. The result is smoother, softer, healthier, and younger looking skin. Dead Sea minerals and anti-oxidant Vitamins A&E nourish and protect the skin from dirt and pollution. Plant extracts, such as Chamomile, calm the skin after shaving, and Ammonium Lactate maintains the skin’s moisture throughout the day. For all skin types. • With Dead Sea Minerals.